If you’ve ever taken a management or accounting course, you may have heard of Eliyahu Goldratt’s Theory of Constraints. The gist of the theory is that the efficiency of systems and processes is always limited by a small number of constraints. In a factory, for example, the constraints could include the number of employees, the speed of the machinery being used, and time it takes for suppliers to deliver raw materials. The philosophy behind the Theory of Constraints (which I’ll now refer to as TOC) hinges on five “focusing” steps aimed at eliminating, or at least shoring up, constraints. These steps include identifying a constraint, exploiting the most capacity out of it, aligning all the other processes in the system to support it, finding new ways to break the constraint, and finally moving onto the next constraint. Since we’re right in the middle of this semester’s first big round of exams, I got to thinking about how this theory could be applied to students personally. I believe TOC can be applied to our own lives; it can be used to eliminate inefficient activities that impede progress towards our goals. These are the four factors that I believe are the biggest roadblocks to success in studying for exams. Let’s take a look at how each of them can be overcome. Not having enough time to study is probably the first thing that pops into your mind when you think of constraints. Most of us are quite busy; whether it’s a part time job, a club, a significant other, or that pesky need to be comatose for at least six hours a day, something is always vying for your time. It probably goes without saying that you’ve never followed the old “two hours for every hour in class” adage; in fact, your comparative denominator with respect to that number is probably around five or six. If only there were just a couple hours more to each day! Time management is, unfortunately, a zero-sum game. Every single use of your time carries with it an opportunity cost. When people say “I need to make more time for x,” they actually mean they need to allocate more time for that activity by not doing something else. With that in mind, here’s a handy list of things you have the option to stop doing in order to have more study time. A lot of the students I know seem to think that studying is the process of casually glancing over the professor’s powerpoint slides over and over again. They think that if they see the material enough times, they’ll remember it. While this does work, it’s horribly inefficient. According to a study done at the University of Texas (more on that here), people only remember 10% of what they read; on the other hand, the study found that 90% of what you do and say is remembered. The take-away? Make studying an action! Instead of just re-reading, write quizzes and then come back to them a few days later. Cal Newport’s excellent book, How to be a Straight-A Student, goes into this concept in more detail. Another way to actively study is to use the PQRST method, which stands for Preview, Question, Read, Summarize, and Test. This method is especially helpful when reading textbooks. A while back I wrote a post about a program called Anki, which quizzes you with stacks of digital notecards at strategically timed intervals. It’s based on the concept of spaced repetition, which has been shown to increase retention. Part of the reason studying takes so long is that we often study in distracting environments. Do your best to study in an environment that is comfortable and free of distractions. 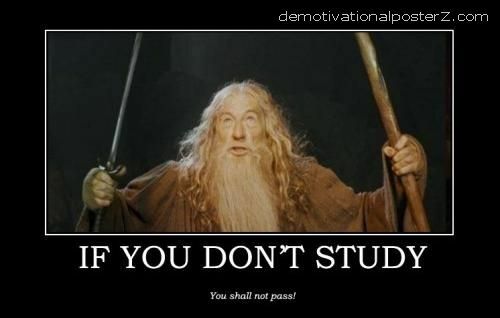 Distractions include friends, video games, TV, the Internet (curse you, StumbleUpon), and even other studying. I find that the best way to study is to go down to the basement of my residence hall, bringing only the material I need for one class. That way, I’m far removed from anything else, and it would take significant effort to switch contexts. When I’m done studying one subject, I take the time to go upstairs and get the stuff I need for the next one. Eat a healthy diet and drink at least half a gallon of water a day. Also, seriously, get enough sleep. I’ll be exploring this section in more detail in a future post. Another possible constraint to your study success is the availability (or lack thereof) of study materials. Common study materials that students often find themselves without include past exams, lecture notes and slides, and past homework. In some cases, it may even be a textbook that you’re missing. Make sure you have access to the right information. Although lack of information isn’t as obvious a constraint as lack of time, it still can pose a problem. If your studies are being held up by not having the right material to study, the solution starts with finding out who’s at fault. After you have that piece of information, you can take action. Not surprisingly, the most common culprit of information deficiency is yourself. Whether it’s not taking good notes, not paying attention to instructions on how to access information, or thinking they can “get by” without the textbook, students often shoot themselves in the foot when it comes to having enough study information. Make sure you exhaust the following list of information sources as much as you can before you go pointing any fingers. The book is the main source of information for most classes. Usually, a good chunk of your test will come straight out of it. That said, it’s not the most efficient way to learn the material you need in order to pass tests. Walls of text aren’t pretty or fun to stare at; add to that the fact that most professors will summarize a good chunk of the book’s information in class and you have a source of info that more and more students are deciding not to bother with. However, books really are the most detailed source of information there is for a class (besides APIs for programming classes). I consider my college education to be an investment, so I’m not going to hinder that investment by denying myself a great source of information just to save a couple hundred dollars. Therefore, I would urge you to buy the book for your class unless you absolutely know you won’t need it. If books are too expensive for you, there are always methods of getting them cheaper. TextbooksRUs.com sells international editions of most textbooks, which are usually identical to the domestic edition but printed in black and white. I’ve found books on that site for 10% of what I would have paid at my campus bookstore. Another option is to buy used books from students taking classes the semester before you do. You’re liable to get a good deal, because selling the book back to the bookstore is probably going to net them even less that what you’re willing to pay. One last option is to check if your school has a program that lets students come to the campus library and check out textbooks for a few hours at a time. This option is great if you’re in a smaller class; using the book is free and you’re forced to read it in a good study environment. Beware of relying on this option in a bigger class, though; you may find that the book is never available for you to use. For some more great tips for saving money on textbooks, check out this article on HackCollege. Taking good notes during class is essential. You may think you’ll remember that “easy” calculus formula when the professor writes it down in class, but you’ll kick yourself later on when you’re trying to apply it to your homework. Since you’re paying for classes anyway, you might as well devote your full attention to learning the material. That means storing information presented there in an intermediate medium before trying to commit it to your brain. If you’re in a class that doesn’t require you to draw lots of diagrams and pictures, such as a social science lecture class, then I’d recommend you take notes with a laptop. This is a preference thing, but the part that is fact is that you can take notes a lot faster typing than you can writing. I’d recommend using Evernote (which I’ve covered previously), which lets you keep your notes synced to your computer and your mobile device. If you’re in a class that does require you to draw a lot, then paper is probably a better option. Even with paper, there’s a best practice; it’s called the Cornell Method. It’s a way to split your notes up for easier review later. Most of the paper is devoted to regular, structured notes. The left column is reserved for main ideas and questions. The bottom quarter of each page should be filled out after class; it’s a summary of what you learned. By the way, you can still use Evernote for paper notes; scanning your notes into the program will make the text searchable, which is super-handy. Make sure you’re paying extra attention anytime a professor directs you towards any source of information that supplements the class. This includes class websites that hold slides, notes, and other materials, and outside resources that can help with your studies. You may not always use them, but you want to have them at your disposal. Ask professors for resources you need. After you’ve made sure that you’re doing everything possible to have access to necessary study information, it’s time to look towards your professor if you’re still coming up short. Some professors simply choose not to provide students with resources like lecture notes, slides, and past tests. Some particularly diabolical professors won’t even hand back your homework and tests! Sometimes professors have a good reason for these policies; sometimes it’s simply a matter of laziness. In any case, you always have the option to ask for the information you need. Most professors will realize the merit of posting notes and slides online if enough students ask for it, so don’t remain silent. When it comes to getting old tests for studying, you may have a tougher time getting your professor to give up the goods. Some professors don’t like to write new tests, so they won’t release them – even temporarily after an exam for review. In this case, your best bet is to rely on the other sources of information you’ve gathered (unless you’re one of the lucky ones who lives in a fraternity or sorority with a test bank). Most professors aren’t evil and will do whatever they can to help you prepare for exams. So be confident and ask for what you need. Don’t forget to take advantage of their office hours as well; after all, that’s your chance to probe the source that actually writes the test! 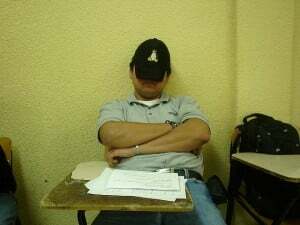 Classes can be boring, I know. However, that 40-minute Facebook reminiscing session can turn into a big problem later on when you look at a test study guide and draw a complete blank. That’s why you need to give your full attention during class; after all, it’s what you’re paying for (I’m allowed to repeat myself). As stated above, make sure you’re taking good notes during class. Not only does this provide you with a great source of information to draw upon during study sessions, but it also lessens your study load by helping you learn the material the first time it’s presented. Be an active participant in class. Ask questions and go all-in on activities. You’ll find that the clock doesn’t freeze quite as much, and you’ll do much better come test time. Also, get to know your professors. A professor that knows who you are is going to be much more willing to help you (not to mention open other doors), and knowing her will give you extra motivation to go to class. In general, make sure class is your most intense learning time. If you’re at an in-state public university, you’re likely paying anywhere from $10 to $30 per class, so get your money’s worth. Ah, the big one. Out of all the constraints to quality studying, lack of motivation has to be the biggest and most devious one. Reviewing notes is boring, and your friends are all going out for hot chocolate. There’s an intramural volleyball game tonight. Marvel vs. Capcom 3 is coming out. There are endless distractions out there, all promising to be more fun and instantly gratifying than studying. So what is a woeful student to do about this aversion to the grindstone? The problem may never be fully solved, but here are a few tips to help you along the way. Humans are creatures of habit. Play that to your advantage and set a concrete study schedule; then, don’t deviate from it. If you’re going to study every night from 7-8 pm, make sure you do it. Start small; you don’t want to set up a schedule that’s going to make you hate life. Even an hour a day is better than nothing. You can use Google Calendar to remind you to do it if need be. Even if you prefer to study alone, you can get a partner and keep each other accountable. Make it a habit of calling each other every night and checking to see if the other stuck to their study schedule. You might even want to study in the same room even if you’re not studying the same material, just to keep each other on task. You can even make this relationship fun; set up a system where the person who skips a study session has to do something. A few ideas are buying pizza, getting a kick in the pants, or having to do the other person’s laundry. The point is to make it painful to skip a session. Negative reinforcement works best when it’s funny. This method of accountability uses the same idea behind using an accountability partner; using your ego/aversion to guilt to force you to study. The added benefit of a study journal is that it allows you to chronicle your success. Every time you study, end your session with a short entry in your journal that verifies that you studied and summarizes what you accomplished. In time, you’ll have a long string of successful sessions. When you get the urge to skip a study session and play Halo for six hours, you’ll be pulled back by the prospect of having an empty entry in your perfect journal. A 10-minute sprint can get you going. A good way to break out of a slump is to set a super-short time interval in which you try to get as much done as possible. This is good for when you’re de-motivated and the prospect of an entire hour of study is making you sick; the ten-minute interval is totally doable and might just break you out of your bad mood. Find an isolated area and set a time for ten minutes. For that ten-minute period, work like a madman. Don’t do anything else; don’t even look up to stare into space. When the time is up, review how much you got done. Your accomplishments will most likely motivate you to continue on. Put this picture near your study area. Not much to say about this one. Just do it. 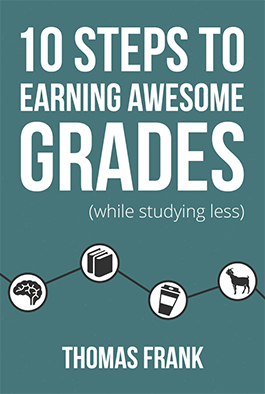 There are a lot of ways to ease the constraints that hinder your ability to study. Next time you’re feeling underprepared, consult these tips to help super-charge your study sessions. If you have any tips of your own, let us know!